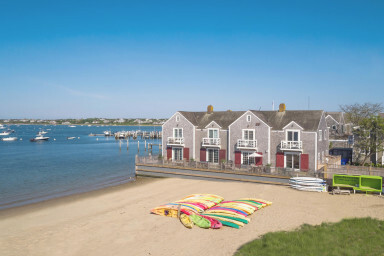 Beautiful Waterfront Townhouse on Nantucket Harbor! Amazing Location! Beautifully updated waterfront townhouse at Kayak Beach just a few blocks from Main Street. Fresh paint, well appointed, new furnishings top to bottom in 2012. First floor: Galley kitchen with new appliances and corian center island. Kitchen is open to living room/dining area that includes a sofabed, gas fireplace and sliders which provide lots of natural light and open onto an ample deck overlooking the beach and harbor. There is a powder room tucked under the steps. Second floor: Master bedroom with queen bed, full bath with tub and a balcony with another great view overlooking the beach and harbor. Second bedroom with two twins and full bathroom with shower as well. The unit has washer and dryer, 3 flat screen TVs with cable and one DVD on the first floor, wifi, printer, phone service and one parking spot. No real need for a car as you are within walking distace to ferries, Main Street, shopping, restaurants, beaches, nightlife.